snap simple stories 1 4x6 months & 1 2x4 days book. 24 double cards in each one. Condition is New. CARDSTOCK PAPER . A snappy way to capture your colorful life! Make cropping your photos easier than ever. Simply overlay photo crop on photo and trim. Acid-free and lignin-free. Imported.". Art & Drawing. Product images are for illustrative purposes only and may differ from the actual product. 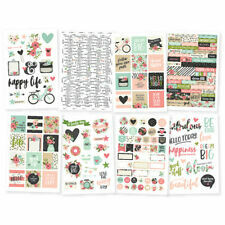 Stickers include floral, phrases, banners, boxes and more. 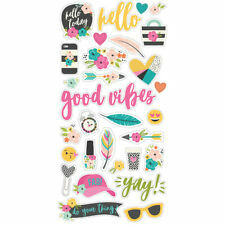 Stickers include trendy designs, phrases, banners, boxes and more. These are the perfect addition to your next paper crafting project. Acid and lignin free. Helpful Links. The perfect addition to scrapbook pages, cards and other paper craft projects! Acid and lignin free. Helpful Links. 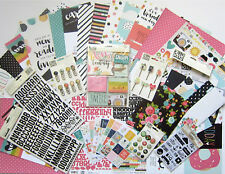 The perfect start to your scrapbooking projects and more! Acid and lignin free. Made in USA. Helpful Links. Simple Stories Easter kit. 1- 6x12 sticker sheet. 6 sheets of double sided pattern paper. To release stickers from backing, just bend the page back to remove. The perfect addition to scrapbook pages, cards and other paper craft projects! Acid and lignin free. SIMPLE STORIES-Daily Grind Collection Kit. 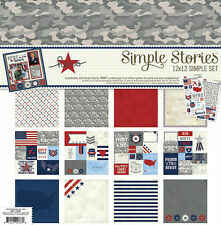 simple stories Collection kit. Perfect for all your paper crafting needs! Includes (55) pieces. Number "25" : 2-3/4" W.
(Floral, bulb “shine”, globe, book, feathers, hearts, “Be Still”). These stickers are part of the Classic Christmas Collection by Simple Stories. One of the included sheets is color and the other two are black. Simple Stories. This set of stickers includes images of a tux, wedding cake, hearts, wedding words, flowers and more! Simple Stories Christmas die cut numbers, 1 - 25. Capture your last vacay in a scrapbook layout with the Travel Notes Collection by Simple Stories. You'll love the images of arrows, travel trailer, travel words and more that are included in this set. Your paper-craft projects will be picture perfect when you use the Clear Photo Stickers from the So Rad Collection by Simple Stories. Simple Stories. Emoji Love Washi Tape. 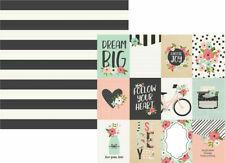 Perfect for planner, scrapbook pages, albums, pocket pages, cards and more! Includes one roll, 15mm x 10 yards. Simple Stories. SIMPLE STORIES-Snap! A snappy way to capture your colorful life! Make cropping your photos easier than ever. Simply overlay photo crop on photo and trim. Acid-free and lignin-free. WASHI TAPE Planner Scrapbook 10 yards. Emoji Love Washi Tape. 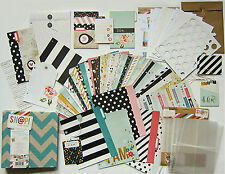 Perfect for planner, scrapbook pages, albums, pocket pages, cards and more! Includes one roll, 15mm x 10 yards. Simple Stories. Simple Stories-Snap! A fun addition to any paper crafting project! Acid and lignin free. Simple Stories-Enchanted Bits & Pieces Die Cuts: With Silver Accents. The perfect addition to any paper crafting project! Acid and lignin free. 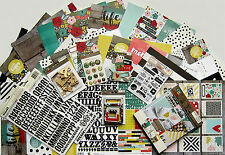 These are the perfect addition to your next paper crafting project and more! Acid and lignin free. Imported.". Product images are for illustrative purposes only and may differ from the actual product. Simple Stories SNAP Collection Carpe Diem Metal Charms #4928 BRAND NEW!! Simple Stories SNAP Collection Carpe Diem Metal Charms #4928. Condition is New. Shipped with USPS First Class Package. Emoji Love Clear Stickers. Clear stickers for your photos! Includes (3) 4x6 sheests of clear stickers; icons, motif, words, phrases. Simple Stories. Coordinates with Simpl e Stories products for quick and easy scrapbooking!